Courtesy of Nespresso, stand to win a pair of *tickets worth $132 to Singapore's newest gastronomic event- Savour! Learn moo-re about coffee, wines, cooking and taste 50 signature dishes from 15 award-winning chefs including 3 Michelin-starred Alain Passard! All you have to do is check out the new Nespresso Coffee Online Encyclopedia and answer the below question by leaving a comment here. Include your email. 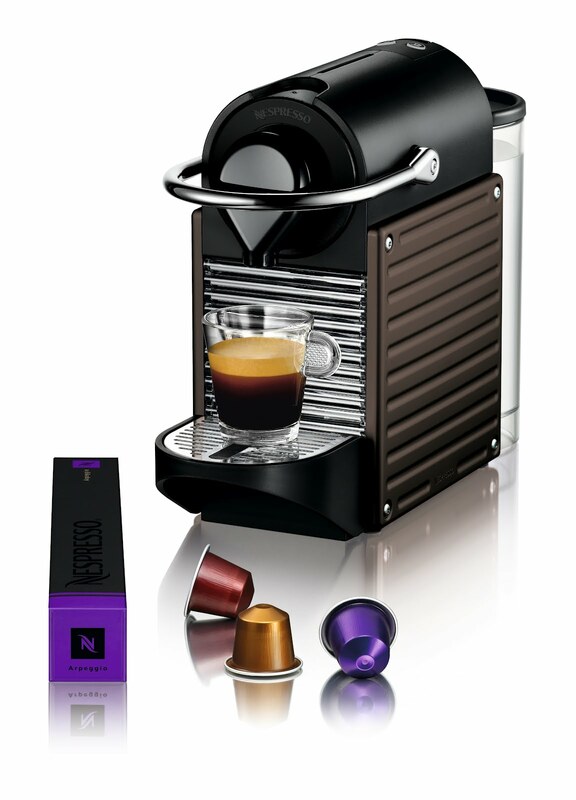 What percentage of the world's coffee beans meet Nespresso's exacting standards? Psst...go see under "Refinement" in the above hyperlink. Moohehe. *Tickets are for entry to Savour this Sunday, 1st April evening (6pm-10.30pm). This giveaway contest ends 31st March (Saturday) 6pm so hurry and spread the word! Be sure to check your email for the winning notice. 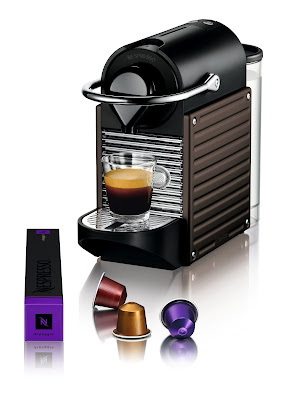 Chew On This: Complete a simple quiz and stand to win a Nespresso PIXIE machine in its latest 2012 colours! Quiz ends 7 April. I love fish soup. It's tasty, comforting and quite healthy! Nothing like a good bowl of fish soup after a night of one too many drinks or rich foods. The Fish Soup ($3) here at Angel Horse Teochew Fish Soup was pretty good. Smooth slices of Batang (Spanish Mackerel) that were cooked just right. The soup was a very cheng (light) yet tasty fish broth. I love that they added a slice of tofu too! So many stalls only give tofu if you order the seafood soup. Then I went to order Lor Mee from another stall. Moohahaha! That's another reason why I love fish soup. It's light and healthy so I won't feel guilty eating a second portion of something else. LOL. Chew On This: To complete the Teochew dining experience, dip the fish slices into a saucer of preserved soy beans and fresh red chili! Interesting small eateries seem to spring up along Tanjong Katong Road. One such place, with a rather cute name, that I visited just recently was Big Bad Wolf. This is one of their signatures- The Big Bad Wolf Burger ($13). I quite enjoyed this with the juicy beef patty speckled with crushed black pepper, and caramelised onions. All it needed was a bit more salt to better bring out the flavours. To have meat juices running down my hands was a joy that only juicy burgers could bring. Lamb lovers would likely take to the Guiness Lamb Shoulder Chp ($17.50). This was sort of a stew and the meat was very tender- easily pulled apart with a spoon. I love the tasty, lamby sauce which is made of Guiness and beef jus. Cooking meats with the bone also means a deeper flavoured sauce. Good to mop up with the potato wedges! For desserts, we opted for the Bailey's Chocolate Tart ($6). I would have preferred a more fragrant tart shell but the combination of alcohol and dark chocolate worked well to lure both chocoholics and alcoholics. Moohehe. Speaking of alcohol... just makes one thirsty. Drinking it is almost always better. LOL. A full pint of crisp Stella Artois ($10) is just $8 all-day on Sundays! But it is a shame not to try some of their craft beers available. I got myself a bottle of Hawthone Premium Pale Ale ($12) and enjoyed its tropical rich fruit flavours. Lychee and honey? Yes, but it's thankfully not sweet and had with a nice body. Finally, please note that no Big Bad Wolf on leash is allowed! Moohahahaha. Ask for your Bedisloyal Card and get a stamp with an order of a craft beer (not those on tap). Visit the other 7 partnering places and collect stamps when you order a craft beer (one stamp per place per visit). After collecting all 8 stamps, head back to the first place you visited and get a free craft beer! Disloyalty now has its privileges. After a recent night run, I got hungry and decided to grab a bit of supper. Wanting to opt for something light and healthy, I went for Teochew fish porridge. And then the Teochew noodles stall next to the fish porridge stall caught my attention as I was slurping the porridge. Soon, I found a bowl of Fishball & Minced Meat Noodles ($3) on my table. Moohahaha. I slurped that up too and regretted when I bit into the one lonely fishball. It was so good I wished I had ordered the plain fishball noodles....not bak chor mee + 1 fishball. Needless to say, I returned for the fishballs a few weeks later. The Fishball Noodles ($2.80) had eggy noodles in a pretty spicy chilli paste mixed with black vinegar and lard. But the star was the fishballs. Bouncy and springy are terms that would be inappropriate for the fishballs here. Instead, I would describe them as supple and soft. Delicate even. Just a mere bit of resistance that breaks away as the teeth meets the fishball. Certainly a very low-key place serving very good fishballs. I like! An invite to witness a 1-Michelin-starred Japanese ramen chef at work lured moo up 56 floors up to ION Orchard. The view was pretty spectacular. Feels good to be that high up and when it rains, one can clearly see the clouds, winds and rain movements. This black dry ramen- Umami Ramen was intriguing. Reminded me a bit of a cross between thick, yellow egg noodles with the "kee" (alkaline water) taste and squid ink. Tossed with extra virgin olive oil, spiked with seaweed and a savoury powder (like dried solefish), and served with roast pork, it was no doubt tasty. I went for seconds. Moohehehe. The ramen was made using bamboo charcoal and natrium water- an ingredient that supposedly made the ramen "lighter" and more easily digestible. Here's Chef Yasuji Morizumi, owner of Japanese ramen chain Chabuya and Michelin-starred restaurant MINT, who was present to demonstrate the preparation of the above dish. Unfortunately the dish is not served at the cafe but you can still get other bites like an Hor D'oeuvres set ($27.50) comprising Pan Seared Salom with Herb Crust, Ribeye Angus with Compressed Watermelon with Basil, Crab Croquettes with Saffron Puree, Baby Potato Skin with Creme Fraiche, Inkura & Dill, Pork Scratching with Apple Puree Sauce. Sweet tooth folks can opt for the Dessert Set ($18.90)- Choux Puff with Green Tea Mousse & Red Bean, Pumpkin Pie with Vanilla & Pistachio, Blueberry Pie, Grasshopper Pie (Mint & Chocolate) and Strawberry Yuzu Tart. Viva Japan Cafe is a temporary pop-up cafe that will end operations on 31st March 2012. It aims to provide a platform towards creating a community where lovers of all things Japanese can come together. Traditional Japanese arts and crafts will be on display and can be purchased online here. Thanks to Shn Juay for the kind invitation. Fans of Jane Thai who are turned off by the Orchard Towers location (moohahahha. *ahem*), now have a reason to celebrate. Being a proud eastie myself, I am happy to share that they are now in the east! ...Because the Beef Basil Set with Egg ($6) rocked with its simple, pronounced flavours of garlic, basil, chili, oyster/fish sauce and beef. Also awesome with rice was the Green Curry Chicken ($10). I like its creaminess and gentle herb tones. Kang Kong with Bean Paste ($6) might not sound like a rock band but its crunchiness and that explosion of garlic, bean paste and chili from dancing on a hot wok rocks. Want the crunch but a lighter taste? Check out the Papaya Salad ($6)- refreshing, tangy and spicy. I found the Seafood Phad Thai ($5) tasty with a rather appealing depth from fish sauce. The noodles seemed thinner than most and had a nice chew. Would have been awesome-r if the seafood portion were more generous. Mooving on to desserts, Red Ruby ($3) was an icy treat. And hey. I think the red beads of crunchy chestnuts coated with a gummy shell brought to mind the pearls in bubble tea....but with the refreshing chestnut filling. Carb-fiends should not miss the Tapioca with Coconut Cream ($3)! Made me moo with its starchy inner texture coated with a pleasant gooeyness. Not too sweet and with just a good amount of coconut cream to add fragrance and creaminess. Yummy and affordable Thai food in the east. I like! This, moo friends, might look like an ordinary cup of water. But it is delicious! Flavoured with pandan- a nice touch... and it's complimentary. Here there's no GST nor service charge too. Rockz!